DMK President and Chairman of the Tamil Eelam Supporters Organization (TESO) Muthuvel Karunanidhi whose 89th birthday wish was the bifurcation of Sri Lanka started his birthday with hearing all kinds of ominous news when Chennai Corporation and Police started pulling down hundreds of illegal flex boards and then banners illegally put up greeting him and a worker putting up a flex board was accidentally electrocuted. First, the Chennai Corporation telling it is illegal to put up flex boards without proper authority, with the assistance of the police pulled down hundreds of flex boards put up by the DMK workers. While putting up the flex boards a worker A.Karuppannan was electrocuted. After the Corporation pulled down the flex boards DMK workers put up banners suddenly before the celebrations last Sunday. Then Corporation workers came and removed the banners too. “According to officials, after hundreds of flex boards on a few roads had been removed a few weeks ago by the Chennai Corporation, a number of banners were put up on Friday night to celebrate the birthday of former Chief Minister M. Karunanidhi on June 3. “Most of the banners removed were reportedly erected without obtaining a ‘no objection certificate’ of the Chennai Corporation on roads such as Radhakrishnan Salai, Anna Salai and E.V.K. Sampath Salai and surrounding areas. “Temporary flex boards are permitted by the Chennai Collectorate for a stipulated period of time only after obtaining a ‘no objection’ certificate from land-owning agencies such as the Chennai Corporation. However, many of the structures, that are hastily put-up banners on wooden frames, started reappearing in various parts of the city on Friday night. “We took action according to the instructions we received after a meeting of the Chennai Collector and the Corporation Commissioner a few weeks ago. The meeting was organised at Ripon Buildings to sort out issues about the identification of illegal flex boards and hoardings,” an official told The Hindu. “In April 2008, the Supreme Court upheld the Madras High Court’s order, banning illegal and hazardous hoardings in Tamil Nadu. Following this, the Chennai Collectorate directed the Chennai Corporation to remove thousands of hoardings classified as illegal. “According to Act No. 51 issued by the Municipal Administration Department, hoardings cannot be placed near schools, colleges, hospitals, at road junctions, or near heritage structures. A. Karuppannan (40) was electrocuted when the flex board he was erecting at Mulanur accidentally touched a live wire at Mulanur on Saturday evening. He was setting up the flex board in connection with the DMK leader M. Karunanidhi’s birthday celebrations scheduled for Sunday. Police sources said Karuppannan died on the spot. 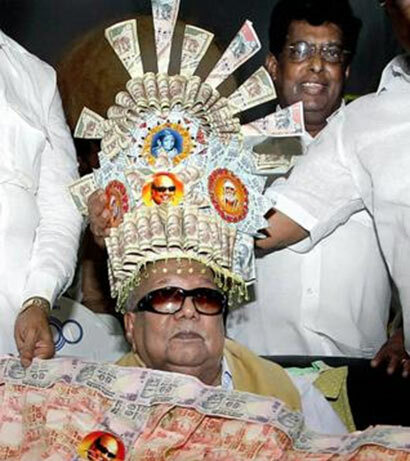 MGR is no more….then why this idiot is still alive…??? Cant even pee on his own…the B______d is trying to divide my country….???? This clown is in his last legs. Is he going to take all that money he is dressed in with him to his grave? There are millions in Tamil Nadu homeless and hungry? What has he and his clan done for them?